Ground fissures were opening up all around me as the earth began to shake more violently than ever before. Suddenly, I knew I could die if I didn't somehow make my way to safety - where ever that was. At just before 5:30pm on Good Friday March 27th, 1964 I was 17 years old and in a gravel pit near our home in Anchorage, Alaska. There was still snow on the ground and my brother Tom and I were learning to jump on our skis. We had built a snow jump by rolling up huge snow balls near the bottom of the road leading into the gravel pit, putting them together and created a ramp out of snow. My brother and I had been getting better at ski jumping, so I was there by my self on that day to increase the height of our ramp. At 5:36pm, the ground under my feet began to rumble. Our family had lived in Alaska for a lot of years, and we had felt a lot of earthquakes. But this earthquake was different. Seconds later, the ground was moving viciously and ground fissures (cracks in the ground) were opening up all around me. Suddenly, I realized that this was a really bad earthquake and I could be killed down there in the gravel pit and no one would know. So I decided to somehow make it up the slippery, snow covered hill to someplace other than where I was. Instead of my winter boots, I had gone down into the gravel pit in my dress boots that had zero traction on the soles. So if I was going to have any chance at running up the hill and not falling into one of the cracks that were opening up all around me, I had to use a ski trick. I ran up the hill using my dress boots like skis. My left boot was pointed to the left side and my right boot was pointed to the right. I ran all the way up the hill jumping over the cracks in the ground and praying that I wouldn't fall. And as I ran, the ground was shaking more and more violently. God must have been with me because somehow I managed to make it to the top of the hill where I quickly looked around. Just to my left was a valley covered with trees that were now swaying violently from left to right as if they were waves in an angry ocean. Behind me was open land covered with small trees and brush. In front of me was a skinny little tree with a trunk about as big around as a garden hose. As silly as it seemed, I somehow staggered over to the tree, fell to my knees, put my hands around the skinny tree trunk and held on for dear life. I quickly noticed how weird the ground felt below my knees and thought to myself, "this is what it would be like to try and stand on Jell-O." In front of me was the apartment complex where my family lived. And right in front of me was a laundry building with a very tall, brick smoke stack. As I looked forward, the brick smoke stack was swaying wildly from the left to the right. Looking around, I started wondering if this earthquake would ever end and I wondered in terror if it was the end of the world. As I turned around to look, my head was being jarred so much by the relentless and powerful shaking, that my eyes were at times seeing a strangely blurry image. But there behind me were 3 small children who were screaming in horror as they tried to walk toward me. But the intense jolting motions of the earthquake kept throwing them to the ground. Turning back to what was in front of me, the huge brick smoke stack continued it's violent and wild dance from left to right. And just as I wondered "how can that smoke stack do that without falling apart? ", the smoke stack crashed downward blowing the laundry room to pieces. Moments ago, I had considered making my way toward the laundry room for safety. Now it was a death trap. Then the rumbling and violent shaking began to end. As I carefully stood up, my body felt like the earth was still wobbling and moving beneath my feet. I was terrified. Was it over or would that horrible, relentless shaking start again and drop me to my knees once more. As I stood there staring in horror at the destruction in front of me, I was frozen, unable to move. What had happened to my world? Was my family okay? Suddenly men were standing by the smoking rubble of what was once a laundry room, as a firetruck arrived. I could see the look of terror on the faces of the firemen as one of them yelled to the crowd "is it under control, is there a fire? We've got fire alarms going off everywhere. If it's under control we have to leave right now." Moments later the firetruck drove off. Then I started slowly making my way toward our apartment. My legs were still wobbly and my mind was numb. In the parking lot, cars had bounced around during the shaking and were pointing in all directions. Just one of many strange sits I would see. I opened the door and hollered up the stairs, "Anna, Tom, are you alright?" My sister and brother answered in tearful voices "Mike, Mike." Moments later I would discover that my sister had been thrown down the stairs during the quake. And our living room furniture was all over the place. The kitchen was a mess and everything had been thrown from the cupboards onto the kitchen floor. Not long after I made my way home, mom and dad were somehow able to make a call. They were in downtown Anchorage, but were okay and were making their way home. They were so relieved that we were okay and we were so happy that they were alright. We slept with our clothes on that night as strong aftershocks kept reminding us that we were not safe. Way into the night we were constantly riding out huge aftershocks and we could hear people running into the streets below, screaming in horror. As I wrote this story I had a bit of a surprising reaction. After all these years, as I retold my story here in some detail, my eyes filled with tears and I had to stop writing as I relived that 5 minutes of sheer terror. 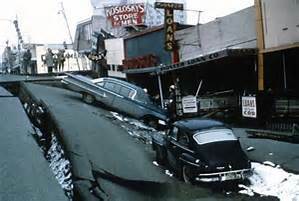 Thank God my family and I and my future wife Mary are all survivors of the Great Alaskan Earthquake of 1964. In 1967 during the time when you were hosting, The Varsity Show, and I was a staff dancer, we asked each other about our favorite food, band and music. Then we asked each other "where were you during the 1964 Earthquake?" Well, we both shared our terrifying stories and were were both so thankful we made it out alive, along with our families. I always felt bad that you were alone though.